Roses, sweet gifts, cookies, and a bouquet of grands! Sweetness abounds... Merry Christmas, Kitty! Congratulations on winning Gina's generous giveaway, Kitty! It was also very sweet of Stephanie to send you a gorgeous bouquet of roses. I love your Merry Christmas teacup and have mentally added it to my bucket list of china patterns. Hee! I'll all about the peppermint these days so I would definitely help myself to a cookie (or two!). Yummy! Merry Christmas! Oh what a sweet giveaway! Your recipe is just in time to finish my Christmas baking! I love peppermint! Merry Christmas to you Kitty and thanks for being so kind! I need to make some more cookies for the piano concert this coming Wednesday since we are going to serve refreshments during the show and I'm thinking these would be perfect. Thanks for the recipe. The gifts you won from Gina are darling and they look perfect with your cookies. And I am thrilled to hear the flowers are still doing well. Much love to you, sweet Kitty! Oh my gosh! These sound so delicious! YUM! Thanks for joining Cooking and Crafting with J & J! Merry Christmas! Lovely sweet cookies with some of my favorites, peppermint and chocolate. Such a pretty vignette. The roses from Stephanie are gorgeous! Congrats on your win. Merry Christmas dear Kitty. Dearest Kitty, what a delight to have tea with you by the fireside. I love your sweet baking santa and especially the one from your dear hubby. Your cookies look so good and I will certainly have to try this one. Congrats on your wonderful win from Gina. What a delight she is. The gifts she sent are beautiful. Stephanie blessed you with gorgeous roses and what a pretty bouquet they are. She is the best and such a blessing. Wishing you and your dear family a very Merry Christmas and many blessings in the new year!! Kitty, your darling Santa bear makes me smile. How special that it was a gift from your husband. Beautiful gifts from Gina. Lots like a wonderful selection of items you received and those roses - amazing! 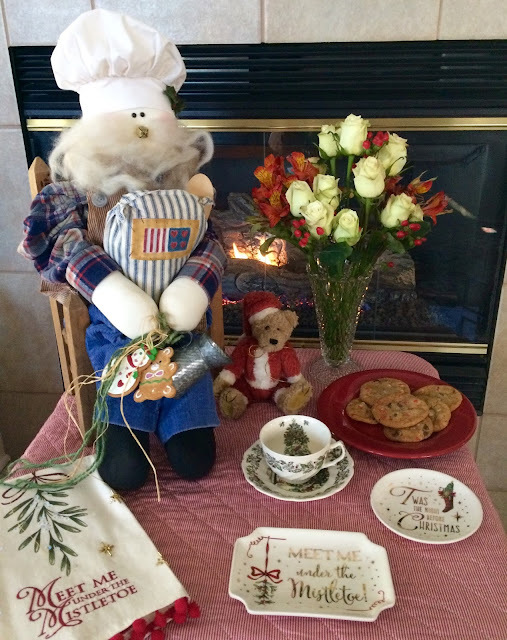 I love your cookie recipe, Santa and sweet table. I am so glad you shared your friendship with these blogging friends! I couldn't arrive at the link - check it for Gina! Beautiful family, Kitty. Mr. Dragon used to give me a bear every Christmas. I think our hubby's are hanging out together. <3 You hit the jackpot with Gina's give-a-way. Fun! I like Johnson Bros anything! You always share the most tempting recipes! Merry Christmas! Oh, Kitty, what a lovely bouquet of roses from Stephanie and the giveaway is very generous! You are very much loved here in Blogland! Your JB Merry Christmas teacup is so pretty and the little bear is adorable. Those cookies look amazing too. Thank you for sharing with us and have a Beautiful and Blessed Christmas with your family! 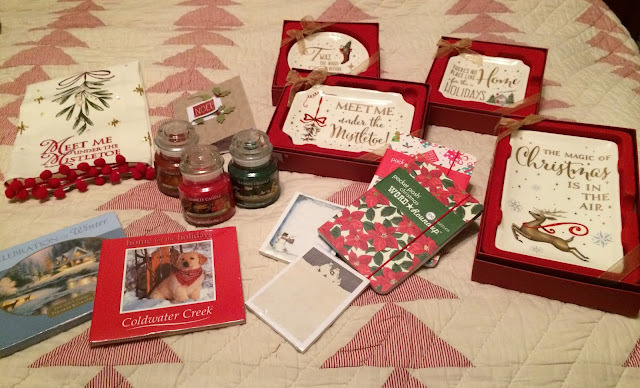 Such lovely gifts...the flowers are gorgeous and lovely Christmas treasures from Gina's giveaway. Your Johnson Bros. teacup has an amazing pattern. 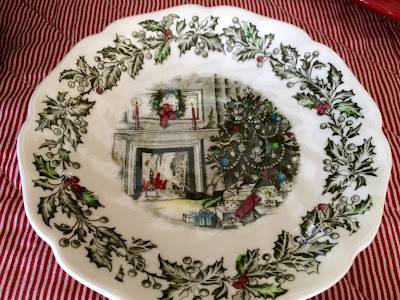 I also love traditional Christmas teaware and decor. Such lovely photos of your beautiful grandchildren! I love your Santas! I don't think anyone can have too many. :) The cookies are delish I know ~ you're a wonderful cook. The gifts from Gina are so wonderful! I know you're enjoying them. The flowers are gorgeous too! I just love to have fresh flowers in the house. The grands are so adorable! I can only imagine how much fun you have with them. I really miss those days. I hope you're having a good week and that you have a Merry Christmas! Holidays are so difficult for our family now...I hope yours are better. Good Evening Kitty~~ Such a lovely tea by your fireside, and those cookies sound perfectly delicious for this time of year. 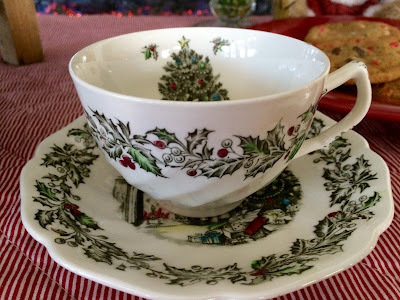 I'm in love with your old fashioned holiday tea cup, my that is gorgeous! Wouldn't a whole set of dishes with that pattern be just lovely gracing ones dining room table on Christmas day? Your roses that dear Stephanie blessed you with are quite pretty, and what a delightful giveaway from Gina. Your grandchildren are precious sharing their Christmas joy with us. Kitty, Those cookies look yummy! Love all your decorations. Have a wonderful holiday! Those cookies look so good. I just copied the recipe for possible future use. And Johnson Brothers patterns are ALWAYS special!! The Johnson Bros. pattern is perfection! So pretty. Like the tree inside the cup. The sweet Santa bear must hold so much meaning. Very sweet pics of your grandkiddos. I hope you have a blessed holiday! These sound even sound good for breakfast! Merry Merry Christmas Kitty! I just love your Johnson Brothers teacup Kitty! So festive. And the cookies look delicious...but I'd do dark chocolate...I don't like milk. What a lovely family! I know you will have a blessed Christmas. Thanks so much for linking to Tuesday Cuppa Tea! I love peppermint...your cookies look wonderful. Many Christmas blessings to you and those you love. The cookies look delicious! Thanks for sharing the recipe...Merry Christmas to you! It must be a great help at this busy time of year to have a baking Santa. What a darling helper! Sounds so yummy! 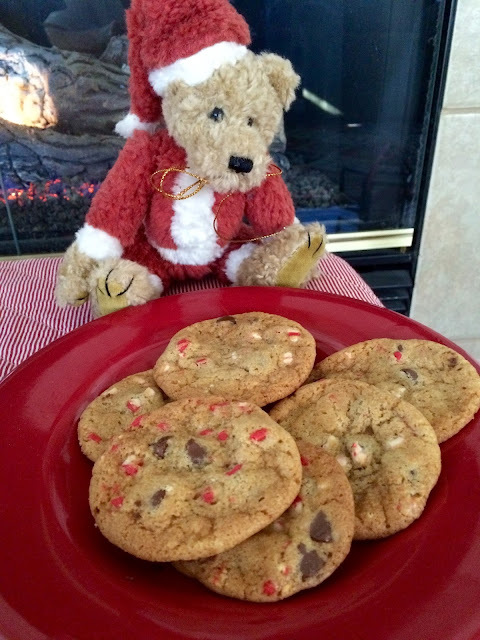 What a festive setting for your awesome Peppermint Crunch Milk Chocolate Chip Cookies. Thanks so much for sharing with us at Full Plate Thursday and hope you are having a great holiday season! Oh, Kitty- you are always so chipper and festive and sweet. I am so glad you won those awesome gifties from Gina - how wonderful! As for Stephanie, she's about as sweet as they come, for SURE. Kitty, I just wanted to stop by your kitchen today to wish you a Happy New Year. I love the pattern on your Johnson's Brothers china. When I see one like that, I am always overcome with a child-like wish to step inside. Your cookies look delicious! Wishing you a Belated Merry Christmas, my friend! I hope you had a wonderful day with your family. 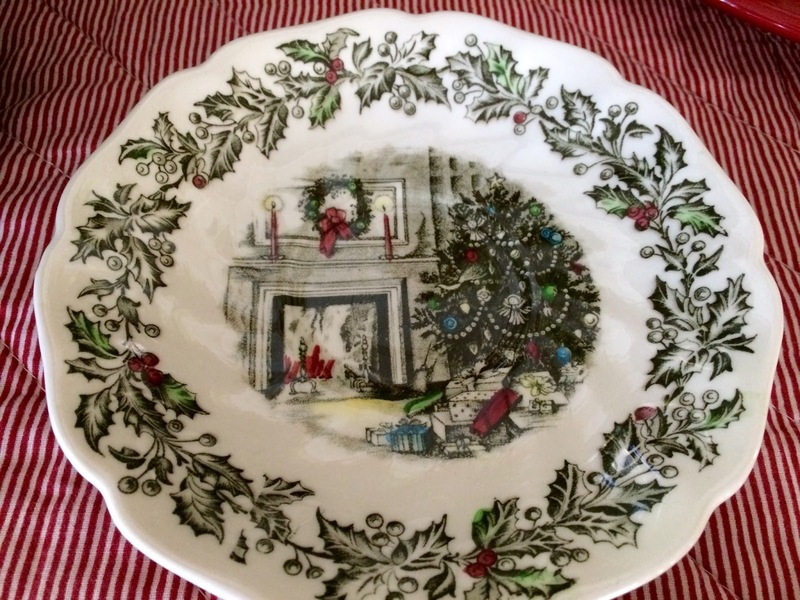 I LOVE the Johnson Brothers "Merry Christmas" teacup and saucer -- so pretty! The baking Santa is really cute; do you have a collection of those? I'm sure the one that Rich gave you is extra special for sure. Your cookie recipe looks delicious, and I'll be pinning it. We actually have a chocolate chip cookie recipe that we love, but I think substituting the peppermint crunch chips would be good for Christmas. You certainly hit the jackpot with Gina's giveaway. What great gifts!! I hope the rest of your Christmas holiday is good, Kitty, and wishing you Blessings in the coming New Year. It looks like I missed this post but must say how much I like the JB teacup and all the goodies you received from Gina's giveaway. That was so sweet of Stephanie to send you a bouquet, she's a thoughtful blogging sister and I received a handmade teacup coaster from her in a card. Thinking of you and praying for family peace in 2016 Kitty. Hi Kitty, Hope you enjoyed a special Christmas. We got back from our trip and had a nice relaxing time. It is amazing how being away from the computer can do so much good! Wishing you a beautiful new year. Prayers for you and your family to be blessed with health, happiness and much love in 2016. Happy new year dear Kitty. May the new year bring you joy and happiness. I love this post my friend. Thanks for the cookie récipe, you know how I love cookies and can't get enough recipies, lol! Here to wish you a very happy and blessed new year to you and yours. I so need to try these! The pictures made my mouth water.